I live in New England, where everything is under a thick blanket of snow, and the temperatures are in the single digits. Many forms of transportation have come to a full halt. And I still needed to get to New York to lead a Facilitative Leadership training! My train was very late, and I realized, I could fume and panic, but that isn’t likely to change the situation. (Tried that. Didn’t work.) Since leadership often means noticing and naming what is really happening right now, I decided to take a few moments to notice what this weather can teach me about leadership. Living Systems Change: Many people called our first snowstorm Juno a “bust” because it produced less snow in some parts of the country than forecasters predicted. And many people are cranky because the following storm dropped more snow than meteorological models predicted. Poor weather forecasters, they just can’t win! Although we talk about “weather systems” all the time, we seem to forget that storms are living systems. The one thing that is true about every living system, whether it’s an ecosystem or an organizational system, is that living systems change. And because they are alive, although many outcomes of a living system are predictable, there are always results that mathematical models cannot calculate. We call the outcomes that foil our plans and escape the predictability of mathematical logic models “emergence.” And so, the frustrating unpredictability of a winter storm – or any other system I’m a part of – also reminds me that I am in the middle of something that is changing and alive. My snow shovel and I can facilitate an intervention in this system, and shape how it impacts me. But the snowstorm is a life of its own, and I am not in charge. Keep Calm and Carry On? Carrying on during winter snowstorms is in my bones and blood. I grew up in the Midwest, where snow comes in horizontal bands off the Great Lakes. Gales routinely push up the avenues downtown with such force that the city lines the sidewalks edges with rope guides to keep people from being blown over. So I was totally perplexed when the governors of New York, New Jersey, Connecticut and Massachusetts closed all the roads during the blizzard. Who ever heard of such a thing? 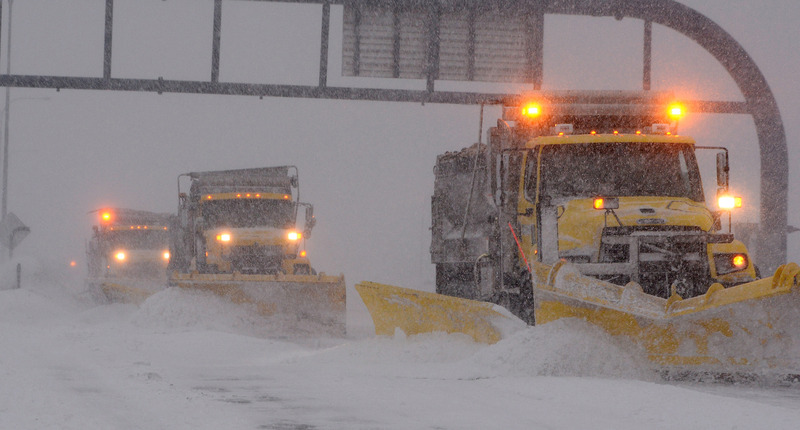 Why did these state leaders stop everything, just to get the road plowed? They remembered that people matter. Facilitative leadership is not simply the art of making things happen; it is also the art of helping people be safe and connected to each other for the long run. Those governors took a lot of heat for guessing wrong about the severity of the impact of the snowstorm. But, in spite of flooding, iced-over interstates, and massive power outages in the geographically most vulnerable communities, few people were hurt and almost no one was killed. Plan for the Rescue Train: Then came a rescue train. That’s what Amtrak calls it when a train is cancelled or delayed, and an unscheduled train show up to pick up its passengers. The snowstorm cancelled my original connections and almost left me stranded. But when I stepped out onto the connecting tracks, a conductor was sweeping the snow from the vestibule of the train sent to keep me and fellow passengers from being stranded in the cold! The snowstorm reminds me that effective leadership includes planning for The Rescue Train. That means more than having an Emergency Continuity Plan to keep business moving. The Rescue Train is both a process and an outcome. It means having a process that everyone understands, and feels appreciated for their part in making it happen. When staff gets called in to work on the Rescue Train on their planned day off, they understand how important their work is. Having a clear, shared plan about how the Rescue Train works means that conductors know what to tell their passengers, so that passengers aren’t afraid of being stranded. Attending to this process is what helped me and all the other passengers achieve our outcome – getting to New York City! Do you have a plan for your Rescue Train – the one that remembers that people’s feelings matter and that having a clear and responsive process also matters? I’m not sure what the outcome metric is for planning for the Rescue Train. I just noticed that everyone on the rescue train thanked the conductors as they came through our car.